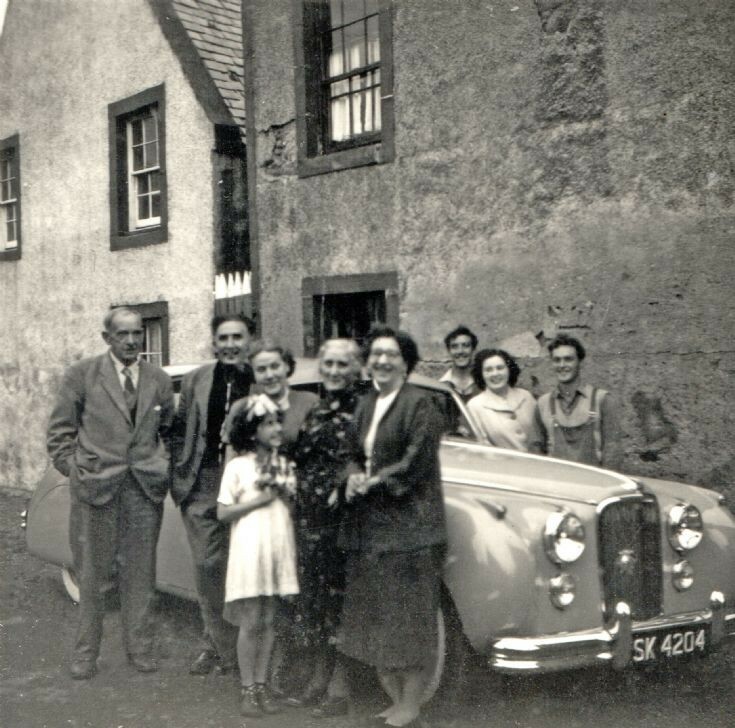 These are (left to right) Donald Robertson (Da, my great-grandfather), Hugh Robertson, Nellie (Helen-Jane, my grandmother and Hugh's sister), Christina (Da's wife, my great-grandmother), Barbara (Hugh's wife) and young Joyce Robertson at the front. Behind the car are Donnie, Alice (my mum) and Ronald. The car belonged to my father - Da looks less than impressed by their showing off! The house behind them is the old Shore Inn on the Gordon's Lane side which is where my mum's family lived until it was demolished, which must have been soon after this. 1959? You can see the house next door on Google Streetview to give you an idea of exactly where the Shore Inn was.